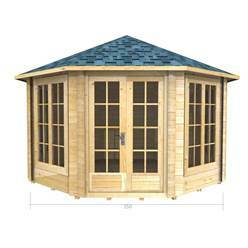 The Corner Octagonal cabins are perfect for your garden if you require something a little different to a standard log cabin. Not only will one of these cabins fit perfectly into one corner of your garden, freeing up more garden space this will provide a ‘tidy’ finish to your garden. One of these buildings will take up minimum space outside - but provide maximum storage space inside. Due to its octagonal shape it can feature more windows providing more light into the building making this the perfect cabin for an art studio. 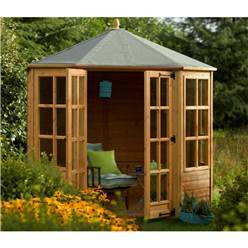 Some of the Corner Octagonal cabins even include an extra door which is just perfect for easy access. Our range of Corner Octagonal cabins are available in many sizes and designs, sizes start from 8ft x 6ft and go as big as 15ft x 15ft. Some have a single door which maximise your inside space, some have a double door which can be particularly useful if you are storing large items inside the cabin. Opening windows are also included with a selection of these cabins which is perfect if you are using the cabin for living purposes or if you are intending on spending a considerable amount of time in the cabin. The opening windows are also a great way of ventilating the building, preventing condensation. Georgian bars are also an appeasing feature in the windows and doors giving these cabins a real country, homely feel. Extras are available, such as a humidity fan, heating and cooling packs, electric packs and insulation. Please do not hesitate to contact us regarding these options. The doors and windows are available in single glazing or double glazing, this choice is purely made on personal preference and what it is you intend on using the building for. Due to the octagonal shaped roof, you may wish to opt for roof shingles instead of the roofing felt. You may find the shingles easier to apply to the cabins odd shape and due to different colours of roof shingles available such as, red, green and grey, you may desire the roof in a particular colour to make the building more personal and unique to you. You must ensure you treat your cabin with a water based treatment for wooden outdoor products once it has been installed as our cabins are delivered untreated. We recommend you treat the building within 4 weeks following installation. If you are concerned about the installation of your product, please do not hesitate to contact us as we do have a professional team of installers with over 25 years experienced available to you for an additional charge. Our installation team are also available to prepare a base for your cabin to be situated on. Please contact us for further information regarding this. The only requirement we need from you is that you will need to measure your area of land accordingly to know what size cabin will suit you best. Other than that, the simple choices and decisions left up to you is to make a choice of which colour you desire to paint the outside and how you are going to furnish the inside. Standard log cabins have four walls and a roof. For lots of people, this is a great design for it offers plenty of space and is aesthetically pleasing to the eye. 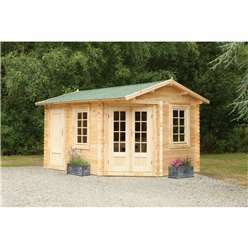 However, if you want something a bit different in your garden, you should definitely consider an octagonal or corner log cabin. 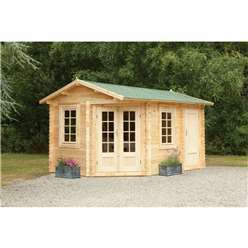 Choosing the right location for a garden log cabin is very important. You can’t just plonk a large log cabin in the middle of a lawn and expect it to fit seamlessly into its environment. The eye will be inevitably drawn to your log cabin, and although you may want people to admire the structure, this admiration should not come at the expense of the rest of the garden landscape. Another point worth mentioning is that any structure you build in the garden must not impede your neighbour’s quiet enjoyment of their garden. Imagine how distressing it would be to head out into your garden, only to find a large log cabin has been built on the other side of the boundary wall and now you can’t see the afternoon sun. So think very carefully about where your log cabin is to be sited before you progress to the buying stage. 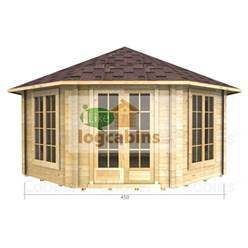 The great thing about an octagonal or corner log cabin is that it will fit nicely into a discreet little corner of the garden. Once in place, your new log cabin can become a bolthole where you can hide away from the rest of the world. Smaller octagonal log cabins are perfect for this. 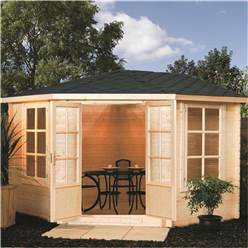 Imagine having a pretty little octagonal log cabin at the bottom of the garden – the doors are open wide to reveal a comfortable chair and table, with books, a reading lamp, and some pretty hanging baskets. Besides taking up less space in the garden, which is useful if you have football crazy kids, an octagonal log cabin is likely to have more windows than a standard log cabin with four walls and a roof. Windows mean light, which is very important in any outdoor living space. For most people, the whole point of buying a new log cabin is because they want to spend more quality time in the garden. Often the weather isn’t quite warm enough to sit outside, but with a handy log cabin in the garden, you can enjoy the best of both worlds: peace and enjoyment in the garden, plus somewhere warm and dry to relax. Because of this, it is worth looking for a log cabin with plenty of windows. The more windows you have, the more natural light there will be. This will make your new log cabin an enjoyable place to spend leisure time, and if you want to use the space as an art studio or reading room, natural light is even more important. So look for a log cabin design with windows on every panel. Georgian windows are a popular design feature on octagonal log cabins. They give a log cabin a homely country vibe, which goes well in an English country garden. The other main difference between an octagonal log cabin and a traditional apex or pent-style log cabin is the roof design. An octagonal log cabin has eight walls, which means it also has eight roof panels. Roof felt works perfectly well on other designs, but with an octagonal roof, roofing felt is not the best choice. Instead, look at roof shingles, which are easier to fit on to the quirky shape of an octagonal roof. 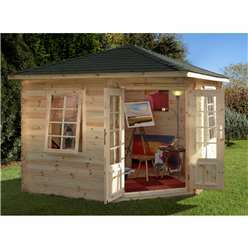 You can even choose from a variety of different colours and personalise your log cabin at the same time as making it 100% waterproof. 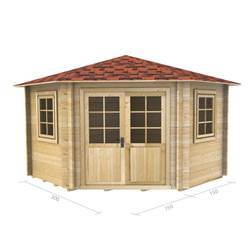 Double doors are a popular design choice on larger octagonal log cabins. An extra door gives you greater access to the space inside. In the summer, you can open both doors for maximum ventilation. Some log cabins also feature an extra door on the side of the structure, which again is perfect for creating an open, airy atmosphere. Anyone who enjoys outdoor entertaining will appreciate the extra door, as it makes it easier for guests to wander through the cabin without being caught up in a traffic jam. 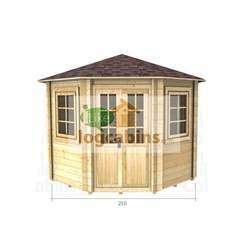 Don’t forget to think carefully about how you intend on using your octagonal log cabin. Thinner walls are OK for occasional summer use, but if you want the cabin to be available all year round, look at a log cabin with thicker, more insulated walls. For more information about any of our log cabins, speak to one of our customer service representatives today.